Thinking back to my lacrosse days, it’s a wonder I didn’t tear something with our totally inadequate pregame routine. A quick jog around the field, some jumping jacks, and then about 5 minutes of various stretches, held for about 10 seconds each, some with bouncing. Then, we went right into the game. And we did nothing post game. Completely wrong, dangerous, and ineffective. For stretching to be effective, you need to do it right. Static stretches are done while the body is at rest. The goal with static stretches is to gradually elongate the muscle to the point of discomfort and then hold that position. Always warm up before attempting static stretches or better yet, save them for after the WOD. Attempting static stretches without warm muscles will result in injury. The seated hamstring stretch is a static stretch. Dynamic stretching involves activating certain muscles or muscle groups, most often the ones you will be using in the workout. By moving or holding a position during the stretch, you are increasing range of motion and warming up the muscles at the same time. It is a highly effective form of stretching. A good example of a dynamic stretch is the Samson Stretch. When we are exercising, we are contracting our muscles. 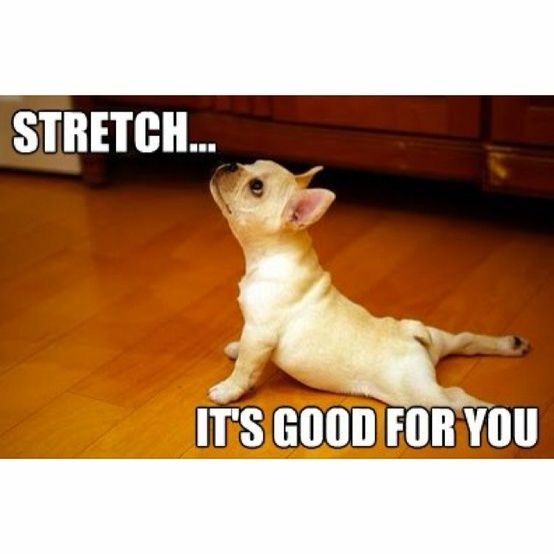 Stretching is a way to counter that contraction and return elasticity to the muscles by loosening them up so they are elongated and prepared for further activity. Failing to stretch can result in weakened muscles that are tight and have poor range of motion. Modern research has shown that to get the most out of your stretching, you need to ease into the stretch, and hold for 1 to 2 minutes. If this is too difficult to hold, hold for as long as you can, briefly come out of the stretch and then ease back into it, attempting to push further. Short duration stretch holds have shown to have little benefit. So to improve range of motion in a stretch, we just need to push harder, right? Not really. Let’s use our hamstrings as an example here. I sit in a car for up to 10 hours a day. You might be stuck at a desk. Both positions are killing our hamstrings. Over time, the hamstrings shorten and become tight due to the daily memory if you will, that they develop due to what they are being asked to do, or not do, during most of the day. Say you attempt an assisted seated hamstring stretch with the goal of increasing range of motion. This is where you sit with legs together and fold and reach forward with someone pushing on your back. You’re going to go through several stages of sensation, maybe like, “ok I can feel this”, “all right this is starting to get tight”, “ok you can stop now”, “holy cow that’s too far”, and “my leg just snapped off.” Somewhere in the vicinity of “ok you can stop now” your nervous system kicks in and puts the brakes on any further progress you can make. It does this because the nervous system decides what is safe or not for you to do and wants to avoid injury. It puts limits on the amount of elongation it will allow because it doesn’t want you to hurt yourself. If you’ve ever had the opportunity to pick up an unconscious person you’ll know they are like a wet noodle. You could practically tie them into a pretzel. This is because their nervous system is offline. As soon as they come to, their flexibility limitations return. Short of asking someone to bonk you in the head before stretching, there’s not much you can do to override your nervous system. But you can do two things to help maximize your stretches and increase range of motion. First, really concentrate on achieving a deep stretch, held for a full two minutes, every time you stretch, for each stretch. We all want to talk about the WOD we just crushed, but stretching should require a considerable amount of effort and focus to be truly effective. Second, look at what you can do outside the Box to improve your range of motion. In my case or the office worker’s case, we could get out and walk around or take the stairs. Sometimes rethinking your type of footwear outside the Box can help with lengthening your muscles if whatever you’re wearing is placing you in a position that is encouraging shortening of the muscles. The trick to help increase range of motion is to figure out what is holding you back in your daily life outside the Box, correct it, and put in a focused, solid effort in your stretches after each WOD. Going to mobility or yoga classes certainly won’t hurt either.